With the tactile discs set, children and adults can touch 10 different structures with their hands and feet. Using the blindfold included, the challenge is increased as you then have to describe what you feel. The different structures of the tactile discs are not only a challenge for the hands and feet, they also promote tactile perception. They support development at the same time as children describe what they are feeling. Thanks to the rubber used, the discs feel very pleasant to the touch. Each of the 5 different structures are on both a small and large disc. The larger discs can rest on the floor whilst the smaller discs can be held by children in their hands. Very useful for sensory perception, memory games, etc. Use the tactile discs for perception games in nurseries, schools, when working with disabled people or body perception in a therapy context. 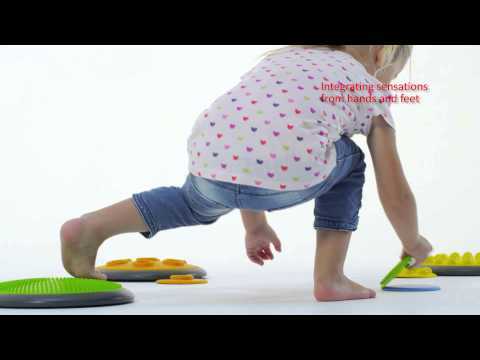 Buy the Gonge tactile discs from Sport-Thieme now.